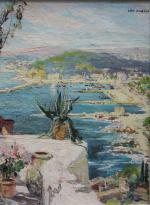 Post-Impressionist view of Nice: the port and the Bay of Angels seen from Mont Boran. This painting was executed in c. 1930s by good listed French painter, illustrator and decorator Léo Fontan ( 1884 Donchery (Ardennes) - 1965 in Annecy ). Léo Fontan grew up in Touraine where his father was affected, he remained at his parents ´ House 10 Rue du Rocher in tours. He followed the courses of the Ecole Supérieure des Beaux-Arts de tours from 1900 to 1903, in the atelier of Félix Laurent and Courault, then was admitted to the Ecole des Beaux-Arts in Paris in April 1903 in the workshops of Fernand Cormon in 1913, Léon Bonnat, Luc-Olivier Merson in 1906 and 1907. He was selected as one of the last ten candidates at the Grand Prix of Rome in 1909, but received no points.His military libretto gives a physical description in 1904: "blond with blue eyes, round Chin, oval face, size 1.67 meters" and suffering from chronic bronchitis that he inherited from his mother.Pierre Lafitte hired him to illustrate the first cover of the small books of the series Arsène Lupin. he then joined the Librairie de l´engraven by Antonin Reschal, where he replaced Raphael Kirchner, and even "mimicked it by drawing small women". He was noticed by Francis CARCO.Léo Fontan collaborates in numerous newspapers such as la vie Parisien, Le Sourire, Fantasio, and draws a few posters and decorations for the Folies Bergère. 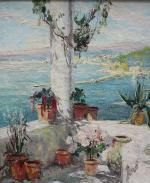 He created furniture, executed gilts, and participated in the exhibition of decorative arts of 1925 and the decoration of liner ships of the maritime courier which the ARAMIS in 1931 with Mathurin Méheut and Yvonne Jean-Haffen.During the second world war, he devoted himself to portraits, still lifes and landscapes, sharing his time between Paris, Touraine and the French Riviera. An officer of the Legion of honour, he received some official commissions for the current National Institute of industrial property, the naval officers ´ mess in Paris and the city of Paris.He is a member of the society of French artists from 1911 to 1946. He paints until his last day despite a failing view. He died at the descent of the train in Annecy on 26 June 1965. Literature: Hans Vollmer "Lexicon of artist of 20th Century"